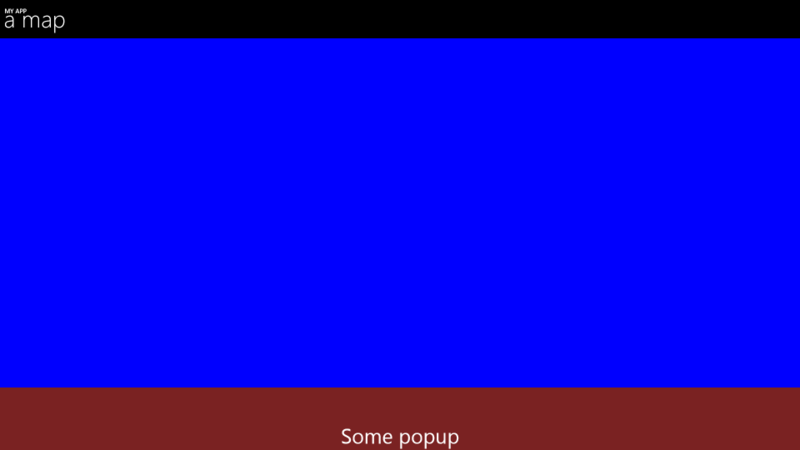 Recently, I wrote about the KeepFromBottomBehavior that helped me to deal with popups that appeared on the bottom of the screen, but were covered by the app bar when using the full screen by applying ApplicationViewBoundsMode.UseCoreWindow. 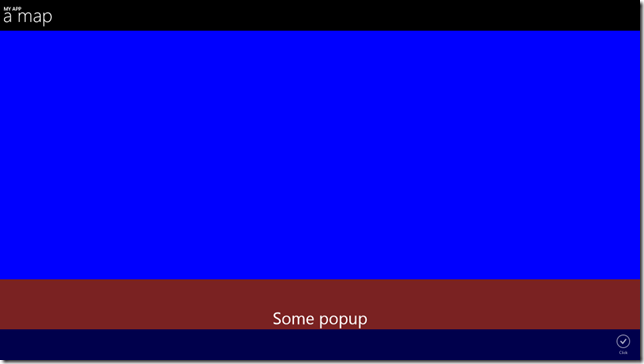 When I started porting parts of Travalyzer to Windows 8.1 as a companion app, I kind of ran into the same problem: popup appearing ‘under’ the bottom app bar. (This time I replaced the map by a simple blue area, to prevent you from needing to install the Bing Maps SDK to run the sample). So I kind-of ported my KeepFromBottomBehavior to Windows 8.1, and got the following result. The WindowHeight is no longer a dependency property and is in fact no longer used, it’s just kept here to keep the behavior’s signature identical to it’s Windows Phone counterpart. In the sample solution you will see this behavior works stand-alone, it does not need SizeListenerBehavior as a companion to bind to. The sample solution is essentially the same as in the previous article, but contains both code for Windows and Windows Phone now. 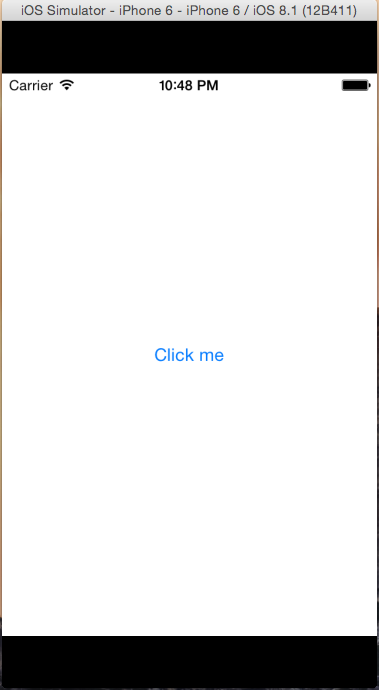 “System.IO.FileNotFoundException” using controls from another assembly in Xamarin Forms on iOS. Disclaimer: I am at the early stages of learning Xamarin and may be just writing some stupid and obvious things. That’s just the way it is. This blog is as much a source of information as a it is a record of my learning process. I am a Windows Phone developer trying to make my code usable on other platforms. 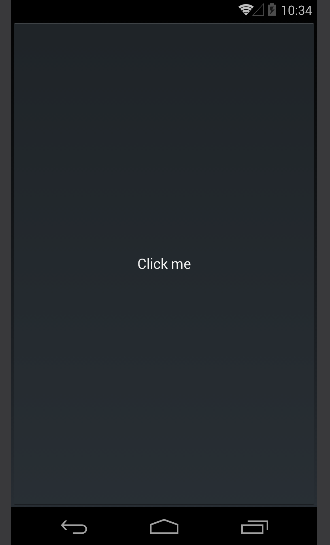 I created a Xamarin solution XamarinPclControlBug for Windows Phone, Android and iOS using the “Blank App (Xamarin.Forms portable)” template. I created a separate extra PCL PclControl that would hold some controls I was creating. 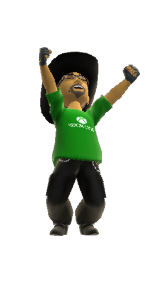 I deployed on Android and Windows Phone, and all was rosy. System.IO.FileNotFoundException: Could not load file or assembly 'PclControl' or one of its dependencies. The system cannot find the file specified. You can check your references and deployment settings all you want, my friends, it turns out there’s probably a bug in Xamarin Forms’ iOS implementation. If you use controls and only controls from a PCL or dll that does not contain other code that is called from the app, apparently Xamarin on iOS ‘forgets’ to load/deploy the assembly (or something like that). But there is a work around. If you comment out the var b = new MyButton(); in the sample solution it will not work – if you do uncomment it, it will. Make sure you clean the solution before attempting re-deploy – I have noticed that sometimes making a little change like this is not enough to properly redeploy. I think this is a bug, and one that took me quite some time to track and work around. Creating the control in code was just the result of testing whether the code could be compiled if I created a control from code – and then suddenly it worked, after hours of checking all kinds of settings. Living on the bleeding edge has it’s price. Every time I meet someone from the Windows Phone Map team (or get into contact with them in some other way) I talk about the importance of being able to data bind shapes to the maps. 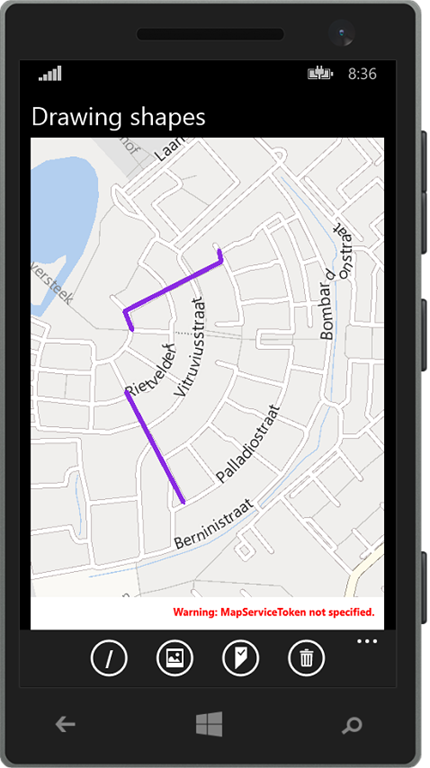 Things are definitely improving: XAML elements can displayed using data binding out of the box (we used to need the Windows Phone toolkit for that), but Map Shapes alas not. As the saying goes – ‘if the mountain will not come to Muhammad, then Muhammad must go to the mountain' I took up an old idea that I used for Bing Maps on Windows 8 and later converted to Windows Phone 8.0 – and basically adapted it for use in Windows Phone 8.1. Including some bug fixes. Important to know is that these elements are not drawn by the map, but on top of the map, by the UI thread. Typically, they are slow. Map shapes, on the other hand, are drawn by the map itself, by native code, and therefore fast. You can add them to the map by adding a MapShape child class to the maps’ MapElements properties. 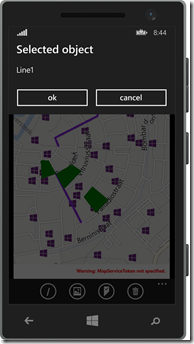 You can choose from MapPolyLine, MapPolygon and – new in Windows Phone 8.1 – MapIcon. Data binding is, unfortunately, not something that is supported. This time, you won’t have to type or have to look at a lot of code, as I have already published all that’s necessary on NuGet – in the WpWinNlMaps package. You simply add this to your application, and you are ready to go. Mind you, this pulls in a lot of other stuff – the WpWinNl package itself, MVVMLight, and some more stuff. This will enable you to bind view models to the map, have them displayed to and make them ‘tappable’. This is all done with the aid of – you guessed it – a behavior. MapShapeDrawBehavior to be precise. Typically, maps are divided into layers. You can think of this as logical units representing one class of real-world objects (or ‘features’ as they tend to be called in the geospatial word). For instance, “houses”, “gas stations”, “roads”. 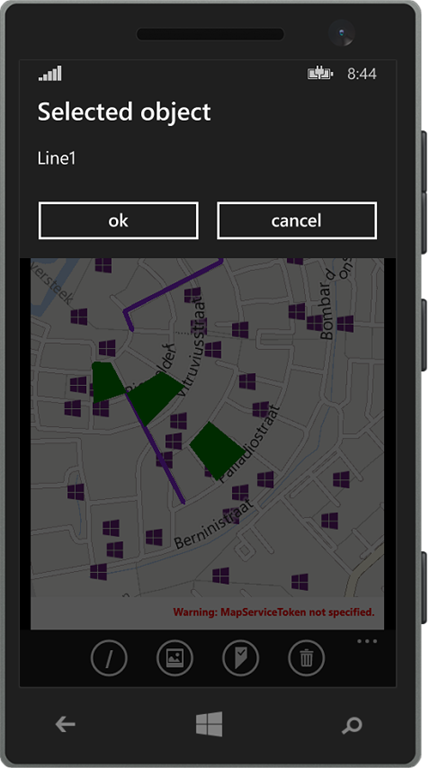 In Windows Phone, this is clearly not the case: all MapShapes are thrown into one basket – the MapElements property. In WpWinNlMaps, a layer roughly translates to one behavior attached to the map. EventToCommandMappers – contains a collection of events of the map that need to be trapped, mapped to a command on the bound object that needs to be called when the map receives this event. Presently, the only events that make sense are “Tapped” and “MapTapped”. When the event “MapTapped” is detected on one of these lines, the command “SelectCommand” is to be fired. Mind you, this command should be on the bound object. Notice this fires a MessageDialogMessage that can be displayed by a MessageDialogBehavior. 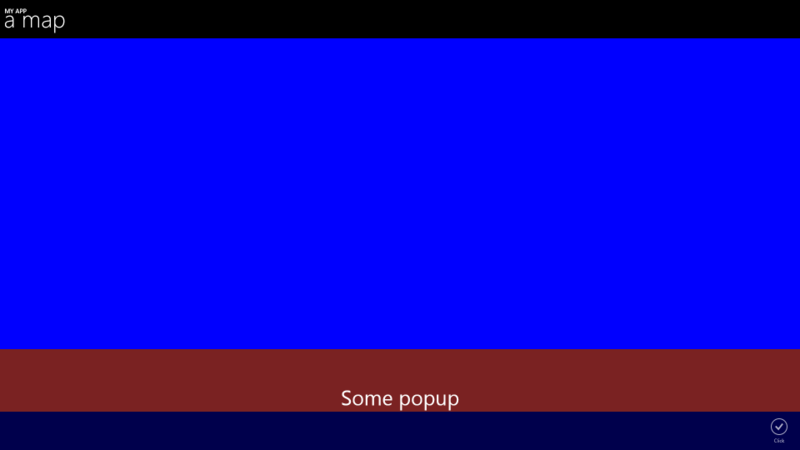 Basically, if all the parts are in place, it will show a message dialog displaying the name of the object the user tapped on. This object is to be drawn as a blue violet line. 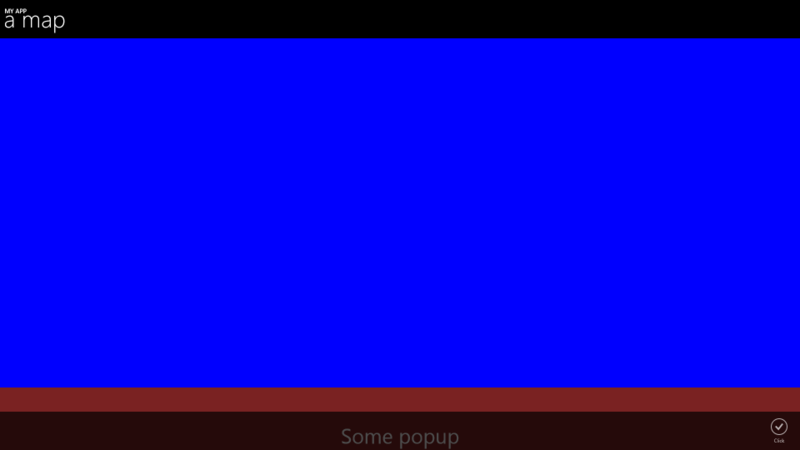 The result being something as displayed to the right. These are classes that turn the Geopath into an actual shape. You get three out of the box that can be configured using a few simple properties. There is only one method CreateShape that you need to override to make your own drawer. You get the viewmodel and the Geopath (as extracted by the MapShapeDrawBehavior and you can simply mess around with it. By adding an EventToCommandMapper to EventToCommandMappers you can make a command get called when an event occurs. You can do that easily in XAML as displayed in the sample. Basically only events that have a MapInputEventArgs or TappedRoutedEventArgs can be trapped. In most real-world cases you will only need to trap MapTapped. See the example above how to do that. Keep in mind, again, that although the event is trapped on the map, the command is executed on the elements found on the location of the event. 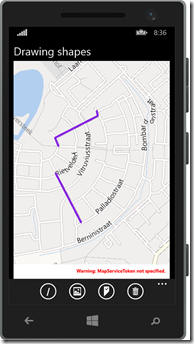 There is a special case though where you might want to trap the “Tapped” event too – that is when you mix and match XAML elements and MapShapes. See this article for background information on that particular subject. Even for MapIcons the PathPropertyName needs to point to a Geopath. This is to create a common signature for the CreateShape method in the drawers. Geopaths of one point are valid, so that is no problem. If you provide Geopaths containing more than one point, it will just use the first point. Although the properties are read from bound objects, those properties are not bound themselves. Therefore, an object that has already been drawn on the map will not be updated on the map if you change the contents of the Geopath. 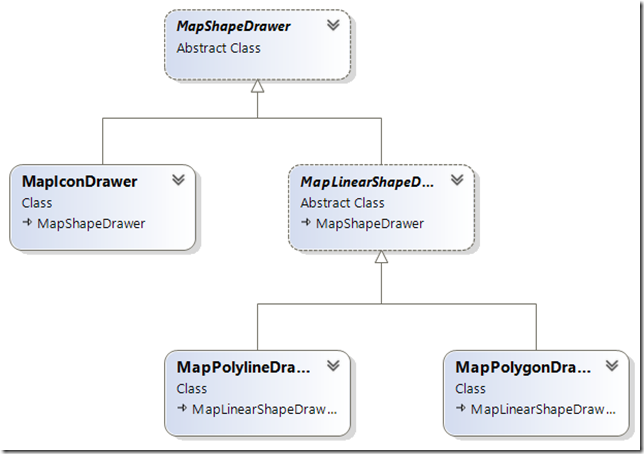 You will need to make sure the objects are in an ObservableCollection and then replace the whole object in the collection to achieve that result. Have the MainViewModel collect those messages, and decide based upon the SelectTime timestamp what messages are the result of one select action and should be displayed together. In professional map systems the order of the layers determines the order in which elements are drawn. So the layers that are drawn first, appear at the bottom, and everything that’s drawn later on top of it. In Windows Phone, the Z-index of each element determines that. So be sure to set those in the right order if you want to appear stuff on top of each other. Be aware that MapIcons are a bit of an oddball. First, they are drawn using a ‘best effort’. In layman’s terms, this means that some of them won’t a appear if they are too close together. If there are a lot close together, a lot won’t appear. This will change while you zoom and pan, and you have no way to control it. Furthermore, MapIcons don’t always show on top of other shapes even if you specify the Z-index to be higher. The sample solution shows the drawing of icons, lines and polygons using the binding provided by WpWinNlMaps. You can tap on a map element and the name of the tapped element will display in a message dialog. This should give you a running start in using this library. Although there are quite some limitations with respect to the binding, mainly caused by the nature of how the map works (you cannot bind to a command that is to be called when you tap the element – you can just provide the name of the command, just like the path property) I think this library makes using the map a lot easier – at least in MVVM apps. I am using this library extensively in my latest app Travalyzer.